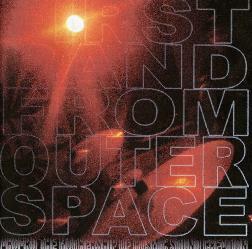 First Band From Outerspace - "Aboard the Mothership of Cosmic Sound Creation"
This is the second demo CD by this young Swedish band. It was recorded in August 2003 at the Studio Moonshine out in the Swedish countryside. This CD is one long 33 minute journey split into 3 titles. We begin with the "Spacenight Flight" in which Johan sings, "I quit my job today, and burned my house away. I burned my money, now it's just me and my honey". What a way to start the day as the Hawkwind influenced spacerock journeys on. It is basically good grooving guitar, bass and drums with some occasional moog oscillations sneaking in here and there and providing a spacey background. The riffs build and then a sample of someone picking up a UFO on radar is playing while the band go totally out into space with guitar solos, oscillations, etc. This leads into "Cosmic Feeling", and the music comes down and goes into deep space with lots of cool sounds and effects. Then the bass comes creeping back into the music. "The Ride of the Desert Storm" is beginning as Johan plays an eastern style guitar and the synths swirl around in the sound. The track slowly builds up and rocks like hell. Great stuff. I think the band is progressing excellent since they were just formed in 2003. I know the band are looking to play some live gigs in 2004 and working on more new material. Let's hope that some label will be adventurous and give this band a chance. For more information you can email First Band From Outerspace at: johanfromspace@hotmail.com.